Summary: Erickson Consulting Engineers, Inc., (ECE) was commissioned by the City of Venice to provide civil and coastal engineering services for design, engineering, permitting and construction documents for new stormwater discharge pipelines at the existing Flamingo Ditch beach outfall. ECE conducted all planning, design, permitting and engineering services for the pump station, treatment systems, directional drilling, diffuser and anchoring system for a new pipeline that will re-route the existing beach stormwater discharge to a deep water location approximately 1,000 ft into the Gulf of Mexico. The project will alleviate the City’s flooding problems due to obstruction of the existing outfalls from sand build-up and periodic water quality violations along Venice beaches. The project will convey approximately 54 cfs of treated stormwater to the offshore outfall. 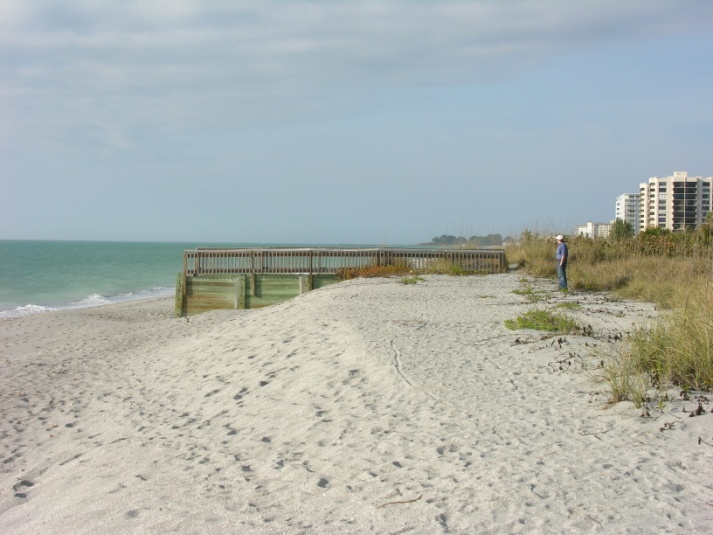 Design changes were made to the existing beach outfall structure and included treatment system overflows of approximately 106 cfs to the existing outfall location during significant, low-frequency rainfall events. ECE conducted 4 water quality sampling events over a 2-month period to serve as the basis for the treatment system design to remove suspended particles and harmful bacteria prior to discharge to the Gulf. Flamingo Ditch serves an approximate 195-acre drainage basin. The treatment levels provided at these facilities are substantial compared to the State of Florida stormwater runoff treatment requirements. Challenges: Offshore HDD–type stormwater discharge pipelines are unique to Southwest Florida, creating unique permitting challenges for the project. ECE coordinated closely between the Florida Department of Environmental Protection, the Southwest Florida Water Management District and the Army Corps of Engineers to facilitate the regulatory process of this pipeline permit. Schedule/Budget: The project schedule was adjusted to address additional time required by the City to obtain easements from the adjacent property owners. Minor budget adjustments were required to accommodate significant noticing of adjacent condominium owners to obtain the State Sovereign Submerged Lands Lease.